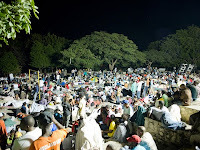 Displaced people gather on Place Boyer in Petion-Ville to spend the night, following a major earthquake on January 13, 2010 in Port-au-Prince, Haiti. A 7.0 earthquake rocked Haiti, followed by at least a dozen aftershocks. On behalf of the Red Cross in the U.S. The donations are added to your cellphone bill.